Last week was a difficult one for me. The minor surgery I had to undergo resulted in restrictions in movement and thus my daily routine. Never mind the associated pain, missing a planned dine out with my friends due to this was more agonizing. But as the saying goes - everything has it's silver lining, I managed to get an uninterrupted break with the support of pain killers and other meds. The man was in charge of the kitchen and other household works. I enjoyed the egg curry for lunch and some not so round paratha for dinner. Yes, being sick now and then is not so bad after all. So this Sunday it was my turn to treat him and of course my little one who relentlessly tried her best to help me and comfort me in her small little ways. As I'm still recovering and not as mobile as I used to be, I planned a quick and easy dish. An one pot meal that only needs pickled onion and raita to go with. 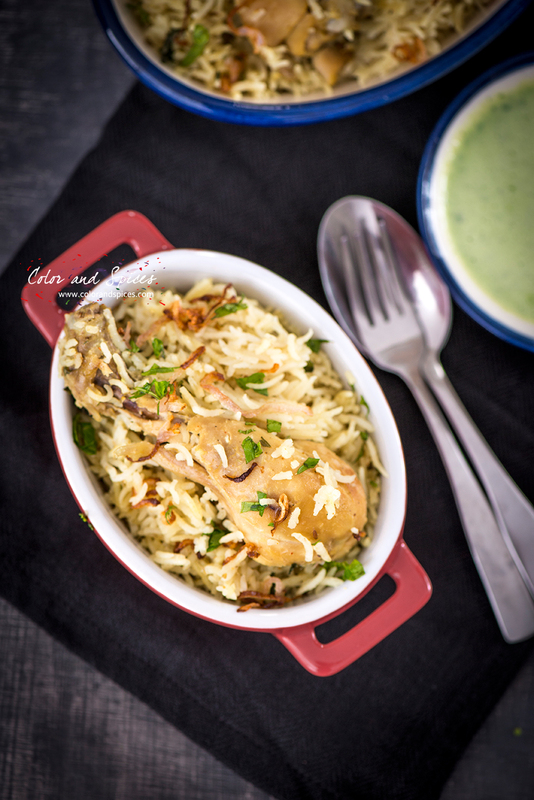 It was a chicken pulao, long grain basmati rice cooked along with chicken pieces. 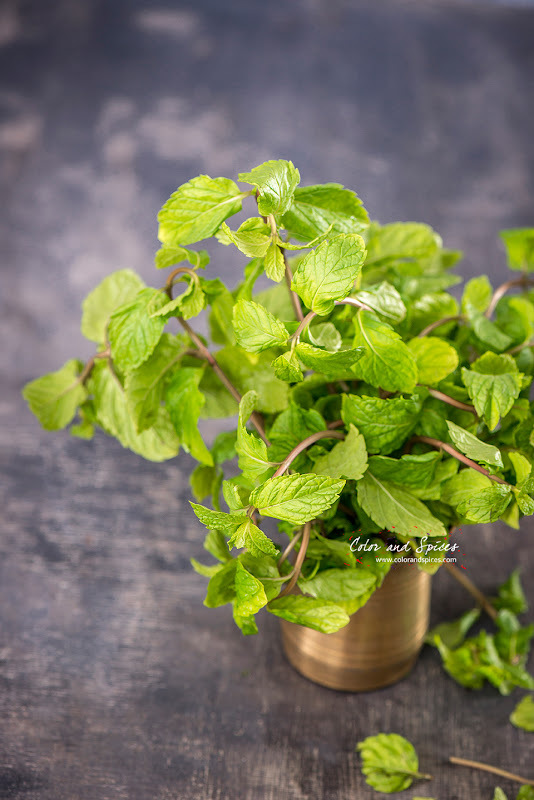 My daughter loves biryani, so I flavored the pulao with my homemade biryani masala, and the special touch was adding a handful of mint leaves to make the dish aromatic and refreshing. 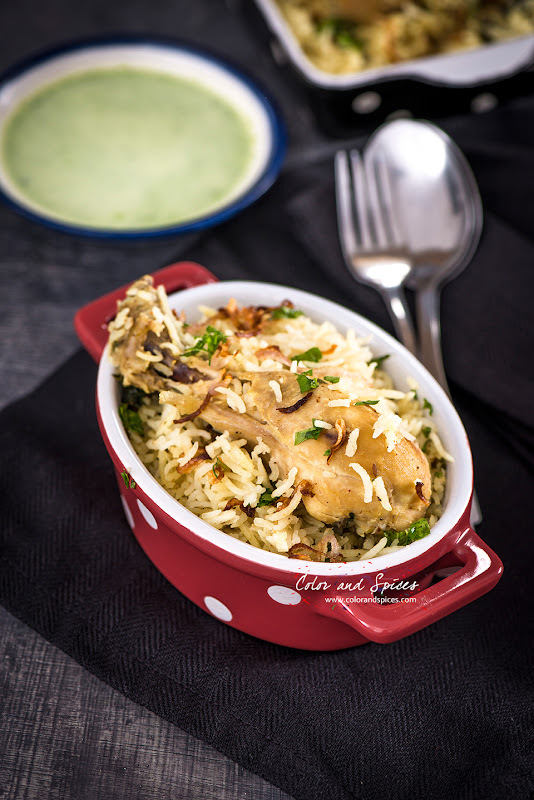 Check my Mutton biryani or Chicken biryani recipe for the birynai masala recipe. I used India Gate basmati rice to make the pulao. The long grain basmati is best of the quality, I use it to make pulao, biryani or simply boil to perfection to go with some dal or curry. 1. Make a smooth paste of the diced onion, chopped ginger, garlic, green chilies (if using). In a small bowl take 2 tablespoons of warm milk and soak the saffron strands. 2. Wash and clean the chicken pieces and pat dry. Marinate the chicken pieces with yogurt, freshly made onion paste, turmeric powder, red chili powder. Marinate overnight or for at least 3 hrs. 3. In a heavy bottom pan heat oil, fry the thinly sliced onion till red-brown in color. Take out the fried onion and keep aside on a paper lined plate. Take care not burn the onions while frying. This step is optional, I personally like the sweet crispy caramelized onion, so took the pain to add this. If you have less time in hand just skip this step. 4. Wash the rice till water runs clear, soak the rice. 5. In a heavy bottom pan (you can use the same pan used to fry the onion, just drain the excess oil) heat 3 tablespoons of oil, when the oil is hot add green cardamom, cinnamon, cloves and white peppercorns. 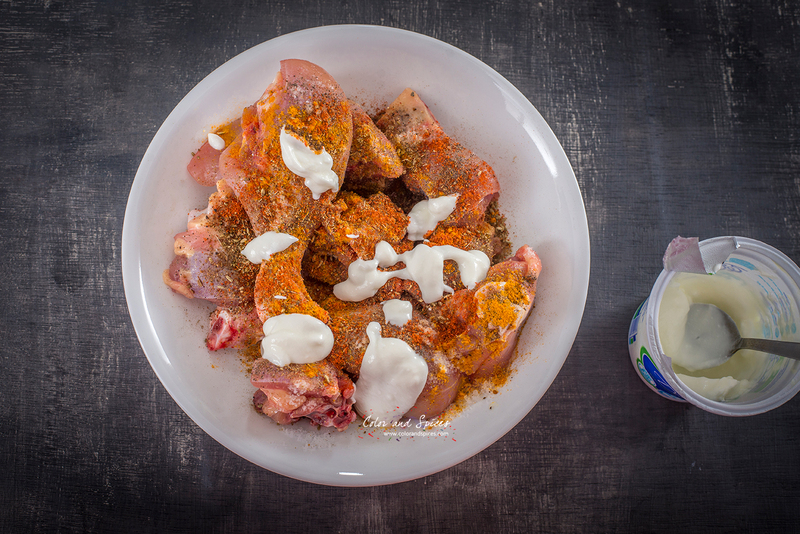 As the cloves start to splutter add the marinated chicken and cook over high heat for 3-4 min. Add salt, mix well, cover and cook over medium heat for 5-6 min. Uncover and cook over high heat till oil separates and water from the chicken dries up. 6. 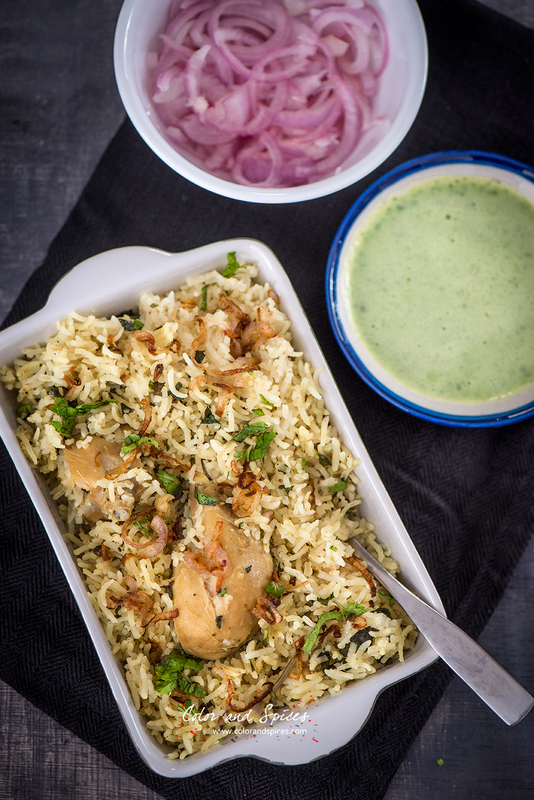 Drain the rice and add the soaked rice to the chicken, add salt, biryani masala, a tablespoon of ghee, mix well. 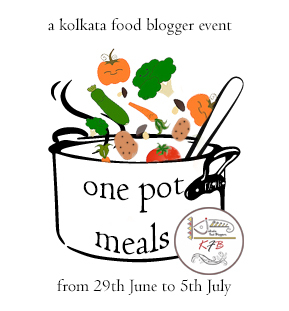 This post is going for the Kolkata food bloggers online event 'one pot meal'. Check KFB page for other delicious preparations on this event. Hope you are feeling better. I have just recovered from a minor tooth surgery. This pulao is tempting - looks of inviting flavours as per my liking.